With its breath-taking view of Mont Blanc, the Comptoir Gourmand terrace is the perfect soothing setting to enjoy your meals in during the summer months. On the menu are refined dishes, savoury or sweet, made with local products and served exquisitely. Indulge in an assortment of sandwiches, freshly baked scones and French pastries as well as our selection of freshly brewed leaf and herbal tea. The Ariana Museum is now the only museum in Switzerland that is entirely dedicated to ceramics and glass, and it is one of the most significant in Europe in its speciality. Built on the initiative of Gustave Revilliod, the Ariana Museum is entirely devoted to kilncraft. Its permanent rooms and temporary exhibitions illustrate the history of the fire arts from the Middle Ages through to contemporary creations. With over 20’000 objects, the collections illustrate seven centuries of ceramics in Geneva, Switzerland, Europe and the East. All the main techniques are represented: pottery, stoneware, earthenware, porcelain, and china. 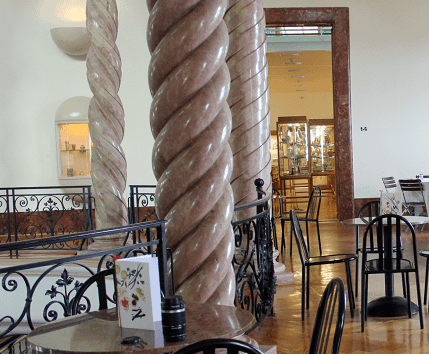 At the Ariana Museum, on the splendid oval gallery surrounded by colonnades, students of the Hotel Management School of Geneva welcome visitors to the Comptoir Gourmand. The Comptoir Gourmand is managed by the Restaurant Vieux-Bois, a gourmet restaurant belonging to the École Hôtelière de Genève, where you will be welcomed and served by EHG students supervised by professionals. Tea room from 10:00 to 18:00, except Mondays. Lunch from 12:00 to 14:00, except Mondays. Terrace with a view on Mont Blanc. Avenue de la Paix 10, CH – 1202 Geneva.